Cody Willoughby | Troy Daily News The cover of “The 50 States and Puerto Rico,” a class project by fifth graders at Cookson Elementary in Troy. Cody Willoughby | Troy Daily News Fifth graders Mykeil Poindexter, Evan Schmidt, and Havi Riveria check out their contributions to “The 50 States and Puerto Rico,” a new class project by fifth graders at Cookson Elementary in Troy. Cody Willoughby | Troy Daily News Lexis Van Zant, Brooklynn Hurd, and Holden Dobrzeniecki admire the varied efforts on display inside “The 50 States and Puerto Rico,” a new class project by fifth graders at Cookson Elementary in Troy. 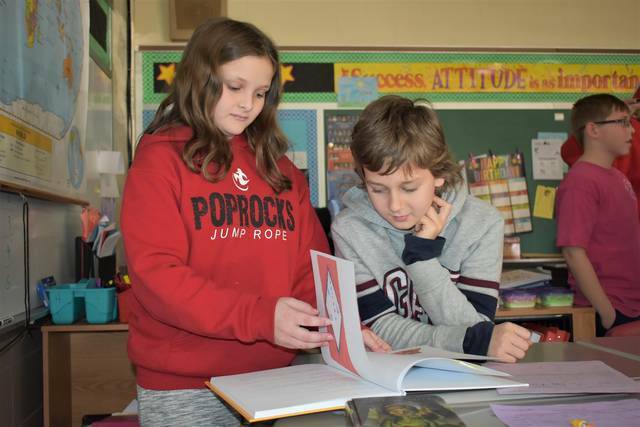 Cody Willoughby | Troy Daily News Fifth graders Gwen Mowery and Lute Green examine the pages of the “The 50 States and Puerto Rico,” a new class project by fifth graders at Cookson Elementary in Troy. TROY — Fifth graders at Cookson Elementary have now become fluent in the process of seeing a book through from word one to final publication. A 112-page research book, titled, “The Fifty States and Puerto Rico,” was unveiled to students on Friday morning by instructor Shelly Stewart, and chronicled original art and research on America’s states and territories by 56 participating fifth graders. According to Stewart, making each fifth grader responsible for their own U.S. state or territory emphasized the importance of thorough research. For a cover design for the 112-page book, Stewart turned to fifth grader Brooklynn Hurd. The finished product was binded at no charge by Studentreasures Publishing, albeit through special permission requested by Stewart, given the product’s high page count. This marked the first time the book-building project had been conducted with Cookson’s fifth graders, but Stewart exclaimed enthusiasm at the thought of reprising it next year. For more information on school events, visit www.troy.k12.oh.us. 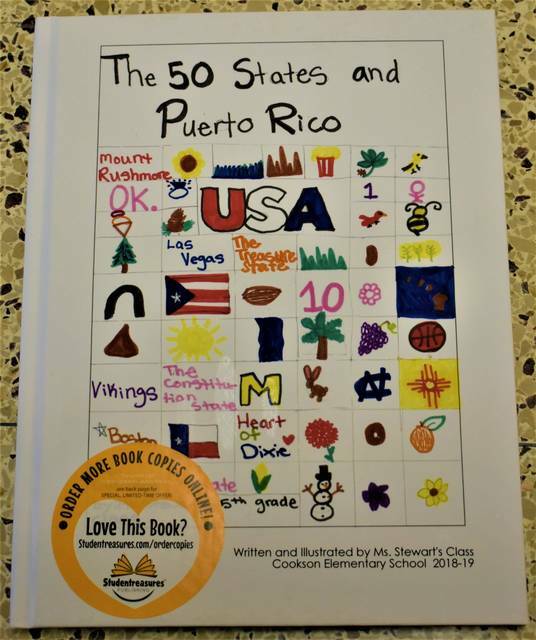 https://www.tdn-net.com/wp-content/uploads/sites/21/2019/01/web1_ConcordBook4-WEB-3.jpgCody Willoughby | Troy Daily News The cover of “The 50 States and Puerto Rico,” a class project by fifth graders at Cookson Elementary in Troy. 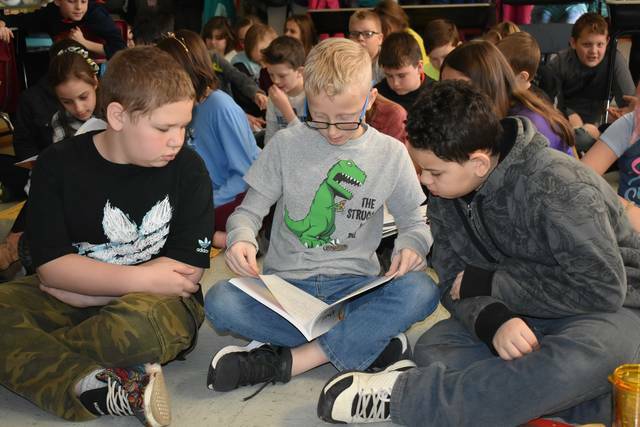 https://www.tdn-net.com/wp-content/uploads/sites/21/2019/01/web1_ConcordBook3-WEB-3.jpgCody Willoughby | Troy Daily News Fifth graders Mykeil Poindexter, Evan Schmidt, and Havi Riveria check out their contributions to “The 50 States and Puerto Rico,” a new class project by fifth graders at Cookson Elementary in Troy. https://www.tdn-net.com/wp-content/uploads/sites/21/2019/01/web1_ConcordBook1-WEB-3.jpgCody Willoughby | Troy Daily News Lexis Van Zant, Brooklynn Hurd, and Holden Dobrzeniecki admire the varied efforts on display inside “The 50 States and Puerto Rico,” a new class project by fifth graders at Cookson Elementary in Troy. 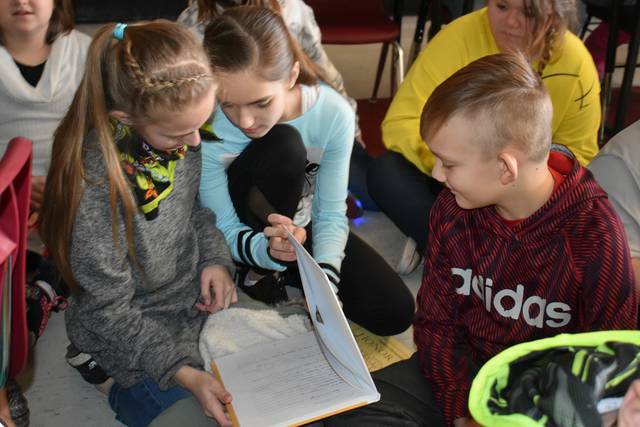 https://www.tdn-net.com/wp-content/uploads/sites/21/2019/01/web1_ConcordBook2-WEB-3.jpgCody Willoughby | Troy Daily News Fifth graders Gwen Mowery and Lute Green examine the pages of the “The 50 States and Puerto Rico,” a new class project by fifth graders at Cookson Elementary in Troy.